Cats do a good job of grooming themselves, but regular brushing to prevent matting of hair is important. Cats rarely need a bath, but one can be given if necessary. Cats object to bathing in slippery tubs, so give your kitten something to cling to, such as a wood platform or a wire screen. 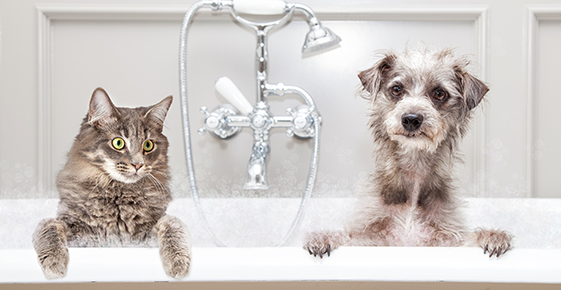 Use a shampoo designed for cats and kittens, as some dog shampoos may be irritating. Place cotton balls in the kitten's ears to keep out water and use an ophthalmic ointment (obtain one that is safe for kittens from your veterinarian) in its eyes to prevent burning from shampoo. Towel dry the kitten completely and gently comb out any mats. Kittens' teeth should be carefully brushed on a regular basis. Your veterinarian can provide you with an appropriate toothbrush, dentifrice, and instruction on how to perform this task so that your kitten learns to accept this as part of its daily care. Regular brushing, bathing, and nail care are essential. Protect your puppy's eyes and ears when bathing, and don't allow the puppy to become chilled after bathing. Your veterinarian may recommend that you do not bathe your puppy when it is younger than 10 to 12 weeks unless absolutely necessary (especially if your puppy is one of the smaller breeds).